Office Christmas rituals can be a little tedious at times. Over a long career in the tech industry I've seen them all, the secret Santas, the dull office parties with tinsel round the monitors, and the yearly challenge of getting the right Christmas cards to the right colleagues. So a year or two ago I hit on a simple solution: instead of cards I'd give out bottles of cider. Nobody finds that an unwelcome gift, and I've removed in one fell swoop the need for both card and present. 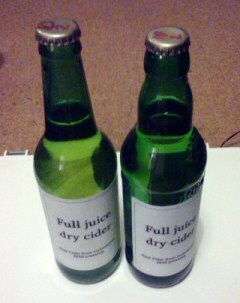 On Sunday I labelled this year's round of Christmas cider bottles. All from 2010 pressings, I had a comparative tasting session last week to decide which ones my colleagues would receive. The labels are standard Avery inkjet labels and were produced using their free DesignPro software. The main panel says "Full juice dry cider" in a large font, with "Real cider from Oxfordshire 2010 pressing" underneath it, and the rest of the label has the following explanatory text and a Happy Christmas message from us. "This cider has one ingredient: apple juice. It's made from eating apples so you'll find it tastes a little different from West Country ciders, and since all the natural sugars are fermented to alcohol it's pretty dry. We like it that way!" Plus an instruction to let it settle before drinking, and a request to return the bottle. As every year, my colleagues and friends seem to appreciate the gift. I get nearly all the bottles back, as well as a lot of praise for the cider. Which is very good to hear.